CAMP SPRINGS, Maryland, June 1, 2010 (ENS) – An “active to extremely active” hurricane season is expected for the Atlantic Basin this year according to the seasonal outlook issued today by NOAA’s Climate Prediction Center, a division of the National Weather Service. Across the entire Atlantic Basin for the six-month season, which begins today, NOAA is projecting a 70 percent probability of 14 to 23 named storms with top winds of 39 miles per hour or higher. The named storms will include eight to 14 hurricanes with top winds of 74 mph or higher. Three to seven of those hurricanes could be major hurricanes of Category 3, 4 or 5 strength with winds of at least 111 mph, NOAA predicts. This outlook exceeds the seasonal average of 11 named storms, six hurricanes and two major hurricanes. As with every hurricane season, said Lubchenco, this outlook underscores the importance of having a hurricane preparedness plan in place. Sea surface temperatures are expected to remain above average where storms often develop and move across the Atlantic. Record warm temperatures – up to four degrees Fahrenheit above average – are now present in this region. Since 1995, the tropical multi-decadal signal has brought ocean and atmospheric conditions in sync, leading to more active hurricane seasons. Eight of the last 15 seasons rank in the top 10 for the most named storms. 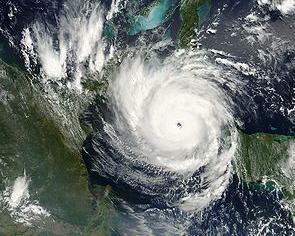 The year 2005 is in first place with 28 named storms. “The main uncertainty in this outlook is how much above normal the season will be. Whether or not we approach the high end of the predicted ranges depends partly on whether or not La Nina develops this summer,” said Gerry Bell, PhD, lead seasonal hurricane forecaster at NOAA’s Climate Prediction Center. “At present we are in a neutral state, but conditions are becoming increasingly favorable for La Nina to develop,” said Bell. Florida State University scientists who have developed a unique computer model with a knack for predicting hurricanes with unprecedented accuracy also are forecasting an unusually active season this year. Scientist Tim LaRow and his colleagues at FSU’s Center for Ocean-Atmospheric Prediction Studies say there will be an average of 17 named storms with 10 of those storms developing into hurricanes in the Atlantic this season. NOAA scientists will continually monitor evolving conditions in the tropics and will issue an updated hurricane outlook in early August, just before what is historically the peak period for hurricane activity. The Deepwater Horizon oil spill in the Gulf of Mexico “is not likely to have a significant impact” on the formation of hurricanes, NOAA scientists say in a May 27 statement. Where there is likely to be damage, however, is when storm surges carry oil into the coastline and inland as far as the surge reaches. Debris resulting from the hurricane may be contaminated by oil from the Deepwater Horizon incident, and also from other oil releases that may occur during the storm. One person who has deep knowledge of both the behavior of hurricanes and the Deepwater Horizon oil spill will be at the helm of the U.S. Coast Guard response to the coming Atlantic hurricane season. 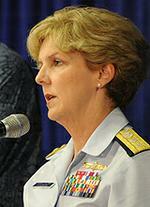 U.S. Coast Guard Rear Admiral Mary Landry, who has been serving as federal on-scene coordinator for the Deepwater Horizon oil spill response since the oil rig exploded on April 20, today will rotate back to her role as Commander of the Eighth Coast Guard District, to ensure continuity of leadership during the 2010 hurricane season. Rear Admiral James Watson, who has been her deputy since April 23, will assume the role of federal on-scene coordinator. A hurricane’s winds rotate counter-clockwise, so, NOAA explains, a hurricane passing to the west of the oil slick could drive oil to the coast, while a hurricane passing to the east of the slick could drive the oil away from the coast.